Hot this week: Cultural appropriation as theft? Anyone who is reading this already knows it’s a bad idea. Stolen from the Saqqara Necropolis, the items were on sale at a Paris auction house. The thieves brazenly took the items out of the church in La Paz’s historic centre. Are the J.E.H. MacDonald sketches in the Vancouver Art Gallery authentic? The heavy bronze pieces may have been targeted theft for scrap. Community members participated in a demonstration to draw attention to conditions at the site. The Toltec site has been severely plundered. It is unclear what caused the South Carolina man to suddenly return the stolen items which he had for decades. Nine copper owl head rattle beads and a disc have been returned by someone named Charles Llewellyn after 28 years. A planning error in their planning. The man slashed the Christopher Wool at the Opera Gallery in about 15 seconds. The piece sailed in the America’s Cup in 1995. Where is it? We’re losing our most precious things. Once they are gone, they are gone. Please speak up about the threat to our national monuments coming from the government. Pueblos of the Rio Grande valley are worried about the review of 27 national monuments. Reducing the immortalisation of negative figures. Contextualise them in a museum instead. Museum of Fourvière in Lyon confirmed that the crown of the Virgin made in 1899 is gone but the gemstones in it have been logged. The tiara was taken from a locked cabinet in the Badisches Landesmuesum. The man had a full Cycladic figurine that was so large and intact that some might question its authenticity. This has to do with the museum being used as the temporary relocation of the Seanad chamber from Leinster House. Pyotr Pavlensky’s asylum has been granted; it’s assumed he is being targeted because of his performance art against the Russian state. Spray paint on the petroglyphs near Malyshevo village in Khabarovsk region. This was during construction and restoration at the museum. Someone spray painted “THE CLASH” in the ladder bit of it because, why not? Because this is Scotland, the most important part of this story is that Billy Connolly lived nearby. The auction house that sold the fake Dylan takes no responsibility and won’t offer a refund. JK Rowling has called for no one to buy the stolen document. The stunt of sending a piece to Russia seems to have not paid off. The man was involved in the 1994 looting of an ancient tomb that involved the theft of a female corpse. The statues were stolen from Bhagalpur 8 years ago. The art collection at the Mumbra property wast targeted twice recently. Two out of the six who are accused of manuscript theft have since died. Recovered after the arrest of three people, the idols are estimated to be 800 years old. On the sad story of the “Persian Princess” mummy, that wasn’t Persian and was probably modern. Coins, lamps, and other metal items were recovered from a home in the village of Beit Ula during a raid. 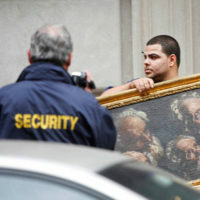 The piece was unearthed during construction work…but is a fake. He had taped the tusk to his body and was trying to move it in to China. On Min Kym’s new book about the loss of her Strad. Can art contain an implied threat to the president? Noting that Asia is where the horn is worth the most.